Next question is why do you want to transfer feeds from one feedburner account to another? There could be various reasons. One classical example is when you want to give away (read sell) your blog along with the feed. Another example, which is my reason too, to move away or group feeds in different account rather than having hundreds of feeds in one account. In the old days you couldn’t transfer feed between accounts? 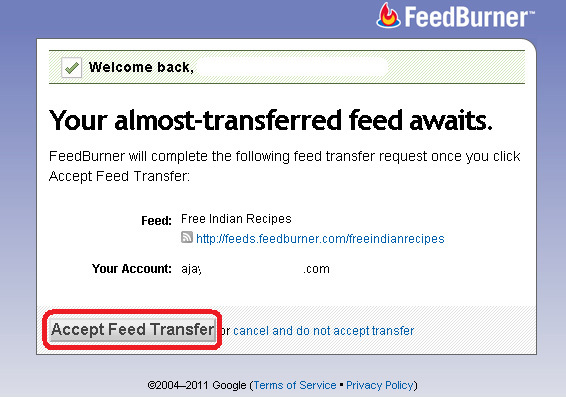 Now tt is very simple to transfer feed between different feedburner accounts. However you need to have a Google account for the target account. 1) Login into feedburner account and click on the feed title to open the feed’s configuration page. Click on that link and it will provide you a box to enter the e-mail. Enter the target e-mail account and click on Send Transfer Acceptance Request. 3) Click on the verification e-mail received in the e-mail and it will direct you to a new window. Accept the transfer request. easy peasy lemon squeezy! Isn’t it?